One man killed in Samaria crash; local officials blame ‘apathy’ that prevented opening of new road. 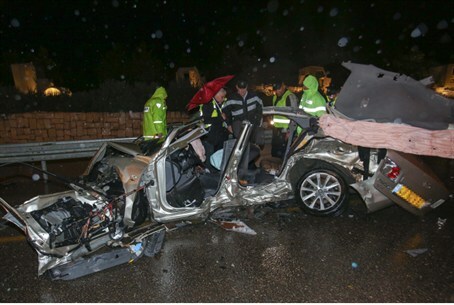 An Israeli man was killed Wednesday morning in a car crash near the Huwarra checkpoint in Samaria (Shomron). He has been identified as Nissan Shalom, 60, of Elon Moreh. According to an initial investigation the man ran into the back of a truck driven by a Palestinian Authority resident. Police continue to investigate the circumstances of the collision. Gershon Mesika, head of the Samaria Regional Council, expressed pain and frustration in wake of the fatal crash. “This terrible crash was easily foreseen, but our warnings fell on deaf ears,” he said. “For more than two years now we have been begging for a new bypass road, for the sake of both Jews and Arabs. All of our appeals have been rejected by the relevant authorities for political reasons. This crash was the price of apathy,” he concluded. During the week-long Passover holiday a serious accident occurred in the same area. Six people were wounded, among them Shimon Namburg of Ariel, who later died of his injuries. His sister was seriously injured as well and remains hospitalized.